The RESPONDALIGHT SYSTEM is a low energy lighting controller with integral four way LED driver. The system is available as a MASTER KIT with occupancy detector, Infra-Red remote control and four RESPONDALIGHT LED Lamps. The system can be expanded by the addition of up to 10 SLAVE KITS each with up to 4 lamps. Each master and slave unit requires a power supply which is included in the kits. 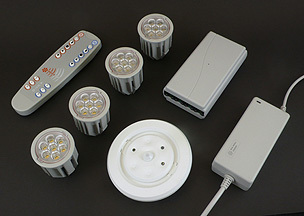 A SLAVE KIT can also be used as a four way non-dimmable driver. Two separate master units can be operated independently from one handset to give dual zone operation for applications such as kitchen/dining rooms. A wall mounted push button dimmer switch version is also available instead of remote control. This version does not have occupancy detection. RESPONDALIGHT lamps can be used as an LED bathroom downlighter and LED Kitchen downlighter to replace halogens. A range of fittings are available to complement the system.